This interesting little polypore is a decomposer of hardwood logs across the continent. 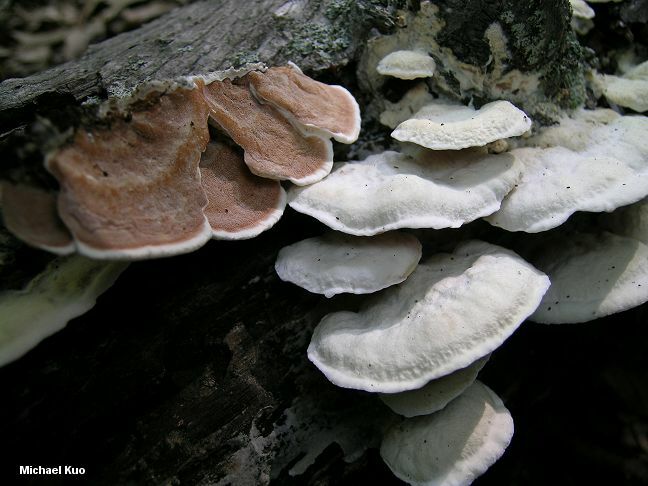 Viewed from above, its creamy to white cap is a bit boring--but its striking underside features an unexpected brown to reddish brown pore surface. 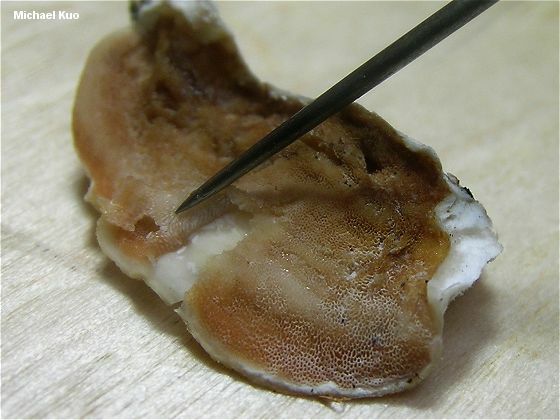 In fact the pore surface becomes even more interesting if you have descended deep into the mire of mycogeekishness and you are willing to pry at it with a dissecting needle or tweezers: the tube layer is rubbery in consistency, and is separable from the cap as a layer. Now that's entertainment. 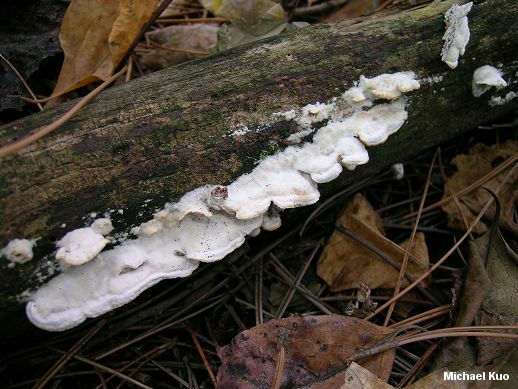 Ecology: Saprobic on the deadwood of hardwoods and, rarely, conifers; sometimes reported on the decaying fruiting bodies of other dead polypores (including Inonotus dryophilus and Ganoderma applanatum); causing a white rot; usually growing gregariously; annual; spring through fall (and over winter in warm climates); widely distributed in North America but more common east of the Rocky Mountains. Cap: Often present and fairly well developed, but sometimes absent or present merely as a turned-over edge above the pore surface; shelf-like and fused laterally with other caps, or kidney-shaped to semicircular; up to about 6 cm wide individually; velvety to finely hairy or nearly bald when mature; with or without concentric zones of texture; creamy to white. 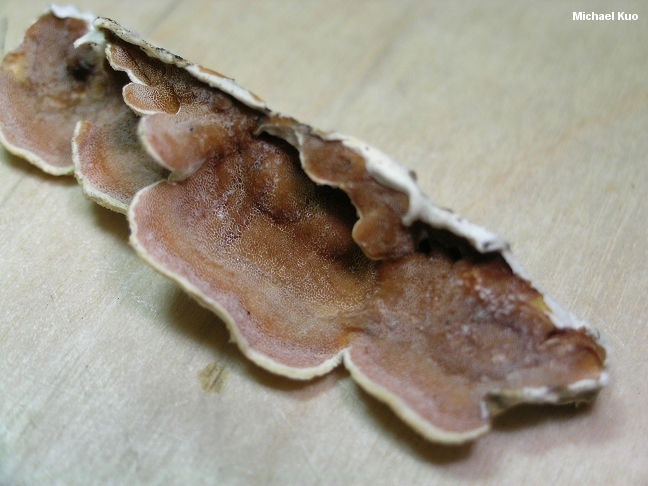 Pore Surface: Reddish brown to orange-brown when young, becoming browner with age (and purplish brown when dried); with concentric bands of color shades; often covered with a whitish bloom; with 4-6 round to angular pores per mm; tubes up to about 1 mm deep, gelatinous to rubbery, separable as a layer when fresh. Flesh: White; cottony to tough; thin. Chemical Reactions: KOH negative to yellowish or orangish on flesh and cap surface. Microscopic Features: Spores 3.5-5.5 x 0.7-1.5 µ; smooth; allantoid; inamyloid; hyaline in KOH. Setae absent. Cystidia absent. 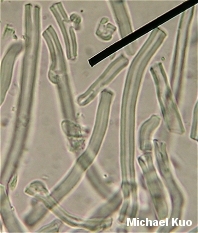 Hyphal system monomitic, with prominent clamp connections. REFERENCES: (Fries, 1815) Bresadola, 1913. (Saccardo, 1925; Overholts, 1953; Gilbertson & Ryvarden, 1986; Phillips, 1991/2005; McNeil, 2006.) Herb. Kuo 08230603, 05030701, 10240702, 10120901.